New technologies are becoming available for managing glyphosate resistant (GR) weeds and reducing their spread. GR crop technology has revolutionized crop production in the developed world and the benefits are gradually spilling over to the developing world. In order to sustain an effective, environmentally safe herbicide such as glyphosate and the GR crop technology well in to the future, it is imperative that the issue of GR weeds be comprehensively understood. 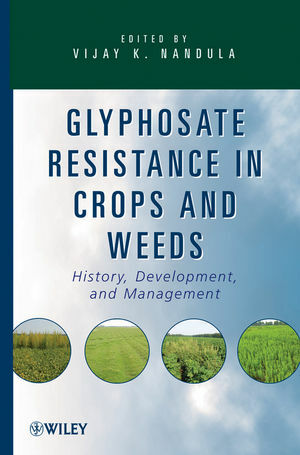 This book provides such an essential, up-to-date source of information on glyphosate resistance for researchers, extension workers, land managers, government personnel, and other decision makers. VIJAY K. NANDULA, PhD, is an assistant research professor at Mississippi State University. His current research focuses on monitoring, documenting, and characterizing the herbicide-resistant weed populations in Mississippi, focusing on their level of resistance, mechanisms, multiple resistance, and biology. 1 Glyphosate: Discovery, Development, Applications, and Properties (Gerald M. Dill, R. Douglas Sammons, Paull C. C. Feng, Frank Kohn, Keith Kretzmer, Akbar Mehrsheikh, Marion Bleeke, Joy L. Honegger, Donna Farmer, Dan Wright and Eric A. Haupfear). 2 Herbicide Resistance: Definitions and Concepts (Vijay K. Nandula). 3 Glyphosate-Resistant Crops: Developing the Next Generation Products (Paul C. C. Feng, Claire A. CaJacob, Susan J. Martino-Catt, R. Eric Cerny, Greg A. Elmore, Gregory R. Heck, Jintai Huang, Warren M. Kruger, Marianne Malven, John A. Miklos, and Stephen R. Padgette). 4 Transitioning from Single to Multiple Herbicide-Resistant Crops (Jerry M. Green and Linda A. Castle). 5 Testing Methods for Glyphosate Resistance (Dale L. Shaner). 6 Biochemical Mechanisms and Molecular Basis of Evolved Glyphosate Resistance in Weed Species (Alejandro Perez-Jones and Carol Mallory-Smith). 7 Glyphosate Resistance: Genetic Basis in Weeds (Michael J. Christoffers and Aruna V. Varanasi). 8 Genomics of Glyphosate Resistance (C. Neal Stewart, Jr., Yanhui Peng, Laura G. Abercrombie, Matthew D. Halfhill, Murali R. Rao, Priya Ranjan, Jun Hu, R. Douglas Sammons, Gregory R. Heck, Patrick J. Tranel, and Joshua S. Yuan). 9 Glyphosate-Resistant Crop Production Systems: Impact on Weed Species Shifts (Krishna N. Reddy and Jason K. Norsworthy). 10 Glyphosate-Resistant Horseweed in the United States (Lawrence E. Steckel, Christopher L. Main, and Thomas C. Mueller). 11 Glyphosate-Resistant Palmer Amaranth in the United States (A. Stanley Culpepper, Theodore M. Webster, L. Sosnoskie, and Alan C. York). 12 Managing Glyphosate-Resistant Weeds and Population Shifts in Midwestern U.S. Cropping Systems (Stephen C. Weller. Micheal D. K. Owen and William G. Johnson). 13 Glyphosate-Resistant Rigid Ryegrass in Australia (Christopher Preston). 14 Glyphosate Resistance in Latin America (Bernal E. Valverde). 15 Strategies for Managing Glyphosate Resistance—An Extension Perspective (Ken Smith). 16 Economic Impact of Glyphosate-Resistant Weeds (Janet E. Carpenter and Leonard P. Gianessi).